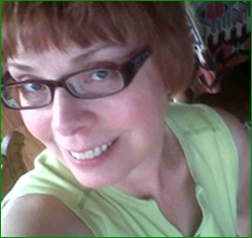 I AM a Sacred Voice EnCHANTress - a gatherer, connector; a creative catalyst for conscious experiences: Sound and Energy healer and teacher; Sacred Voice vocalist; musician; artist; Reiki Master/Teacher; lover of supportive Light Communities and Projects. 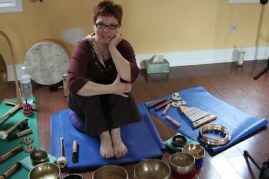 Her life-long love of ethnic percussion and her study of meditation and the “within” world blended when she began using Tibetan and crystal bowls in her practice and group meditations. Incorporation of these instruments resulted in Sacred Voice Immersions, which are deeply relaxing and healing sound meditations. Sacred TranceChant vocalist, Sound and Energy healer and teacher, and body/mind practitioner. Also an artist and clothing designer. Myrrh's Sacred Voice is a blend of toning, sounding, ethereal, non-verbal vocalization, and chant in Sanskrit and other languages not of this world. She has lectured on the sound healing and healing abilities of sound. She has taught workshops on sound healing and sacred vocalization, as well as Nada Yoga (the Yoga of Sound) for several yoga teacher trainings in Indianapolis and at OmTime Yoga in Boulder. Collaborating with other sound healers and musicians is her passion, and she considers herself deeply blessed to be part of several outstanding music projects in Boulder CO, Indianapolis, IN, and in the Jacksonville area of Florida. "I am an artist and creatrix and I work in many materials - from textiles to paper clay and semi-precious stones to pastels to whatever I can get my hands on. I'm big on reclaiming, recycling, reusing, upcycling, and have started UnanImUS ReCycling and ReInvented Cooperative on Facebook for artisans working in 50% or more recycled materials. I'm also a Reiki Master and love to charge my creations with love and good energy. Universal Life Force Energy, the energy of Reiki and other energy healing modalities, ROCKS! Is has an inherent intelligence that goes where it needs to go. It just FEELS GOOD! The Power Goddess pendants are a new series that is near and dear to my heart - for all my sisters out there who feel they need a reminder of WHO YOU ARE! Powerful ones, these are for you!" "Eriana" is the Dragonfly Goddess, imbued with the energy of gentle Healing. "Shashatana" is the Goddess of Limitless Abundance, imbued with the energy of Plenty. "Heratui" is the LOVE Goddess, imbued with the energy of gentle Self-Love and Self-Forgiveness and Acceptance. "Heriata" is the Goddess Power that reminds you to TRUST - regardless of what things look, feel or seem like. Below is a small sampling of prints available.